Come celebrate the centennial of the Grandest park of them all! It’s one of the greatest natural spectacles in the world. Join us in our first year of exploring the many layers of the Grand Canyon. Our focus during the 100-year anniversary of the park will be the popular South Rim. 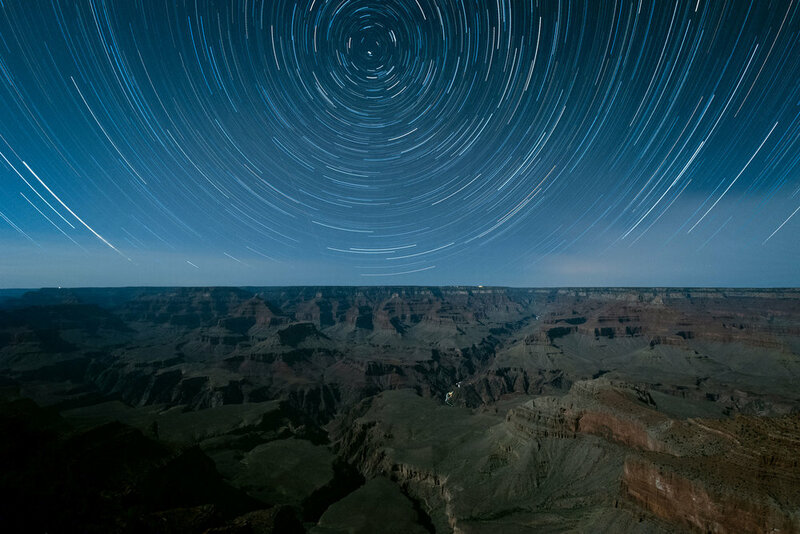 Known for its spectacular sunrises and sunsets, this workshop will emphasize many ways we can interpret the rim—from long exposures to panoramic and time-lapse techniques. We will also prove that the Grand Canyon is much more than a “rim shot.” We will seek the many traces of humankind that can be found along the canyon: Native American ruins, historical buildings and woman-made structures. This is a 5-night, 6-day workshop. Your adventure begins at 10 a.m. on June 16 and ends after a final slideshow on the afternoon of June 21. $1,750 + applicable taxes. Join waitlist below. As with all National Parks at Night Passport Series workshops, we will teach at this location only once. 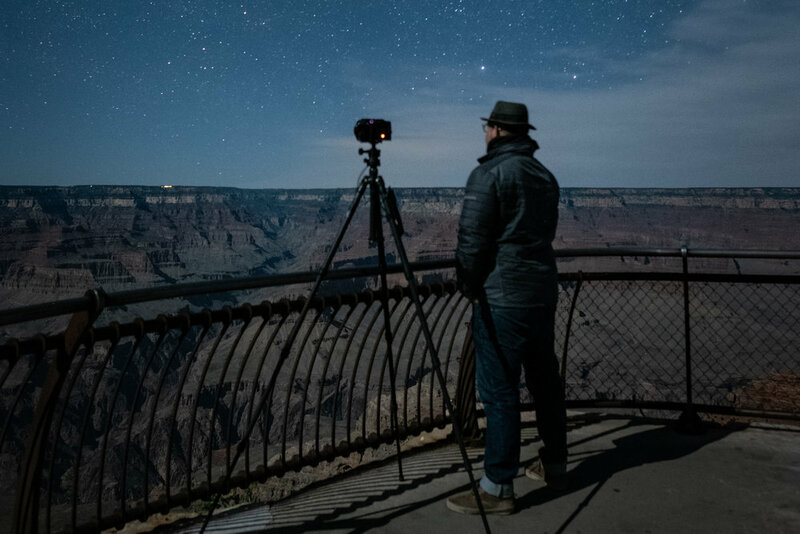 If you have a dream of making epic long exposures at night at the South Rim of Grand Canyon National Park, we hope you join us. We invite you to spend a couple of more days with us right after the workshop and explore a secret slot canyon as well as a sunset and night along Horseshoe Bend. See below for full description and requirements. $400 + applicable taxes. Meal not included. After registering for the main workshop, you will receive a link to optionally register for this post-workshop hike. First come, first-served. Anyone who completes the primary portion of the workshop should have the photography skills necessary for this location. The add-on is available only to workshop participants. Balance of $1,250 due on March 18, 2019. Last day for a cancellation request is March 17 (see cancellation and refund policy). The mile-deep gorge known as the Grand Canyon is 270 miles long and 18 miles wide. We will take a seriously deep examination of time as we photograph cross sections of earth that are 2 billion years old! Of course the night skies are even older, and just as brilliant! We will chase the Colorado River along the many panoramic points along the rim that each show off their unique grandeur, as well as light paint the lesser-known man- and woman-made topography around the park. We scheduled this workshop at the beginning of a full moon, which will rise an hour later each night. The brilliant moonlight will help us see far into the grand landscape and help us to better balance the land and sky. We will study a variety of exposure styles and techniques, from star points, to epically long star and even moon trails, as well as panorama night photography and time-lapse capture. Will we be hiking down into the Canyon? Not all the way. That would take 4 to 6 hours to get down and even more to come back up. (We do plan on exploring the bottom of the Grand Canyon, just not this year.) That being said, the Bright Angel Trail will definitely beckon us to scout some different angles from a few switchbacks. Will we be able to photograph the Milky Way? Right after the Grand Canyon workshop ends (approximately 3 to 4 p.m. on Friday, June 21), we’ll pack our bags and head to Page, Arizona. The drive is approximately two hours long. We’ll check into our hotel and enjoy a relaxing group dinner. The next day at 10 a.m., we’ll meet our guides who will take us to the secret slot canyon. They will drive us to the location and we will have the whole place to ourselves. Is it Upper or Lower Antelope Canyon? No. Those are insanely busy, and do not allow tripods. Again—we will have the whole slot canyon to ourselves for 2.5 hours, right at the prime time to experience the light beams in the canyon. After the tour, we’ll have the afternoon to ourselves. We will meet again an hour or so prior to sunset to caravan to Horseshoe Bend. It is a three-quarter-mile hike to the vantage point. The area will probably be busy for sunset, however once the sun goes down, we’ll most likely have the place to ourselves. The moon will not be up until 11:46 p.m., so we’ll have a few hours of Milky Way photography before the moon lights the foreground. The Milky Way does not rise perfectly behind Horseshoe Bend, but we will try other angles besides the classic shot to incorporate them both. 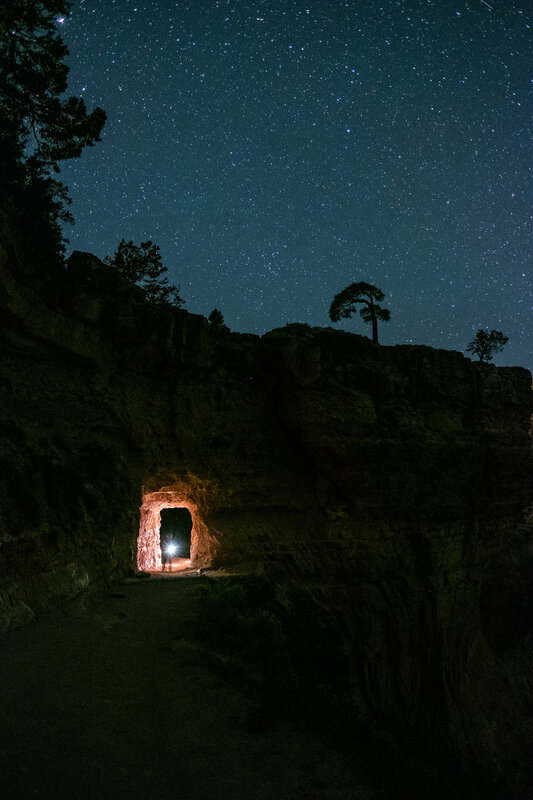 The next morning you can continue to explore the area, fly home or head back to the Grand Canyon for their annual Star Party that Gabe and Chris will be participating in. Note: This optional add-on is available only to workshop attendees. You’ll get a link to purchase a ticket after registering for the main workshop. Participants must have at least basic photo skills, know their cameras well, and be comfortable shooting RAW in manual mode with a DSLR or high-end mirrorless camera. We hope to push you to step outside your comfort zone—to test the limits of what you and your camera can do. You’ll go home after the workshop with a variety of images and interpretations of the Grand Canyon. This workshop will have both field and classroom instruction. We will be in the classroom each day, and out in the field at different locations each night. While in the field, the instructors will demonstrate their own techniques, and work with participants one-on-one to make sure everyone gets the most out of the workshop. During classroom sessions, there will be presentations by the instructors, but we will focus on developing your images and sharing everyone’s work and ideas with each other. Each day will have a review of the previous night’s work. You are responsible for your airfare and car rental. If you are interested in sharing a car rental, let us know and we will try to connect you with someone. Most of the major rental car companies can be found at both Flagstaff and Phoenix. Flagstaff (FLG) — 1.5 hours from Grand Canyon Village, but has limited flights and is serviced only by American Airlines. Phoenix (PHX) — 4 hours from Grand Canyon Village, but has more options for flights. The workshop will be based in Grand Canyon Village. We are working on having your home for the week be footsteps from the rim! Booking info and a group code will be sent after registration. Night photography tends to disrupt most folks’ normal rhythms. Be prepared to run on a slightly different schedule. We typically find ourselves eating two meals per day—a brunch and early dinner. While on the night shoots, you may wish to bring snack food or a sandwich, and plenty of water. There are several restaurant options on the park grounds, but we recommend that you consider bringing snacks and easy-to-prepare meals with you from either Flagstaff or Phoenix. Most of the rooms come with a refrigerator. You are responsible for arranging and paying for your own meals and accommodations. If you are interested in sharing a room with another participant, let us know and we will try to connect you with someone like-minded in the group. It might not look like it, but the South Rim is high desert. Clocking in at 7,000 to 8,000 feet, expect hot days and cool nights. Average temperatures for June are typically in the 80s during the day and 40s after the sun goes down. Bring layers! Recommended attire: To reiterate, we suggest bringing layers of clothing so that you can bundle up accordingly. Comfortable and protective shoes are recommended for getting around the mostly paved walkways, along with some mild hiking. You should be comfortable with the manual exposure operation of your camera, and basic post processing in the image editor of your choice. Demonstrations and image review will be conducted in Lightroom and Photoshop. There will not be any long hikes, but you should be comfortable carrying your own equipment over uneven ground in the dark. No vigorous activity will be required, but please consider your physical abilities prior to registering. Grand Canyon was one of the first national parks I visited and one that continues to have a lasting impression. My first visit was on a road trip out west. I had recently graduated college, and my family gave me an advanced point-and-shoot film camera. I hadn’t been bitten by the photo bug yet, but quickly into this journey across the country I fell in love with directing the single image. I chose to visit the Grand Canyon because two of my friends were working there and, well, it was the Grand Canyon! I remember I had just run out of film and went to the gift shop along the South Rim. I was shocked to find out that all they had was black and white film! I had shot probably 40 rolls of color so far, but bit the bullet and picked up a couple of rolls of B&W to tide me over. When I got them developed, I was amazed at what forms and abstractions came out of even the simplest of images when stripped of color! Within three months I purchased a black and white enlarger, and in true San Franciscan fashion moved into a two-bedroom place with three other friends and converted the only closet into a working darkroom. And I haven’t stop clicking since. More recently, I was excited to revisit such a pivotal place, now way more comfortable with my photography skills. It had been 25 years. A lot has changed for me during that time, but that is microscopic in terms of time in the gorge! The Grand Canyon is the second-most visited national park in the system; the entrance gate reminded me of entering the Magic Kingdom, with at least nine lanes for you to pass through. The park has the biggest visitor center I have been to, and yes there were lots and lots of people. But guess what! I seemed to have the whole park to myself at night. I couldn’t believe it. On four consecutive nights I bumped into three people total—one of whom was a photographer. I also saw eight elk, a few scurrying squirrels and one skunk that left me alone. During the day it was a struggle to get a spot along the rim, but at night it was just me and the dark skies. So come celebrate one of the timeless monuments to time as we Seize the Night at Grand Canyon during their centennial celebration.